According to a Las Vegas City officials, there are 20 commercial projects in various stages of development for the entertainment district, which will cover a six-block area. A mixture of boarded-up properties, small businesses in old buildings and a new entertainment haunt now operate in the area. The Las Vegas City and the district’s owners association is scheduled to embark on a $6 million landscape plan in August to make over this stretch of road. The street will be remade with a downtown Las Vegas history 1950s retro theme that includes 40-foot neon signs down the median and gateways over each end of the district. The plan also calls for a widening of the existing sidewalks to allow for cafes and a narrowing of the street. Unlike the Las Vegas Downtown Fremont Street Experience, this portion of the street will remain open to vehicular traffic, closing only during peak business times of weekend nights and New Year’s Eve in Las Vegas. Would you like to live downtown? Streamline Tower Las Vegas condos is the first downtown Las Vegas hi-rise to have started upward construction. Call 702-505-6988 for VIP Las Vegas condominium buyer representation by a Las Vegas real estate agent. 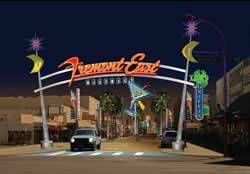 Las Vegas Downtown Revitalizing With Fremont East.